Elana Dykewomon's essay, Travelling Fat, was one of the first pieces of writing about fat activism that I ever came across. In this work she talks about a series of everyday micro inequalities, the low level grind that many fat women encounter daily, those tiny interactions that remind us of our marginalisation. What captivated me were her descriptions of fat-inclusive spaces. Ideas of how good things could be and how to create inclusion were greatly encouraging at a time when I was quite isolated from fat community. Through Travelling Fat, and in others works by other writers, I went on to find a rich seam of fat activism in second wave feminism, in radical lesbian feminism and in lesbian separatism. I was often on the wrong side of these feminisms, painfully so; they offered a flawed frame for my own life whilst remaining powerful and relevant for other people, including many older lesbians. 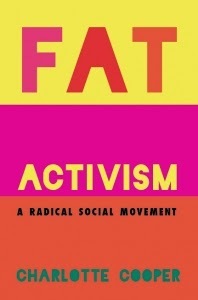 This comparatively extensive body of work offers a significant critique of fat hatred as well as possibilities for social change around fat that addresses systemic power. It means a lot to me and I'm grateful that Dykewomon's work helped lead me to it. Unfortunately this literature is surprisingly overlooked in Fat Studies, and hidden to younger generations of fat activists. I would like to see it made available for discussion whilst acknowledging the difficulties of that process. Dykewomon is a lesbian novelist whose novels contain positive images of fat women and lesbians. Her writing engages with complexity, apparently fearlessly. Her writing on fat from the 1980s to the present is as fresh and nuanced as it ever was. She navigates multiple identities seamlessly through essays, poetry and fiction. If you've never read her work, order something from the library or your favourite bookshop today. It's hot stuff. Anyway, I'm a fan and it's an honour to interview her here, she's a Rad Fatty and a half. How did you come to have fat politics? I must have read about the Fat Underground of Los Angeles in an early issue of Lesbian Connection – sometime around 1976 or 77. I ordered a photocopy of their papers (it cost a $1! ), and hid it under my bed – the way I had with the first lesbian pulp novels I'd bought. The great secret: we can – we must – we do – love our bodies starts out as something we have to hide – not so much because we are ashamed of our desires (although that may linger), but because we are afraid of being shamed by others. It takes a lifetime to deflect what gets thrown at us, as dykes, as fat women – as anything else we may be that makes others uncomfortable. Reading those first Fat Underground pieces inspired me, and I began thinking and writing my own essays and poems. When I moved to the West Coast in 1979, I began friendships with other fat activists, most notably Judy Freespirit. What can lesbian feminism teach people who are interested in building and creating fat culture? One of the essences of lesbian feminism is its interrogation of power. Who holds power? Why? How? Those questions apply to everything we can think about our bodies, including size. One revelation I had, for instance, was while listening to a presentation given by the independent lesbian feminist historian, Max Dashu, on foot-binding. I understood that mothers willingly mutilate their daughters' bodies in order to make them more acceptable to upper- and ruling-class men. The more 'bound' a woman is, the more she has class mobility through her alliances with men in power. This works the same way for dieting. What are the differences and similarities in the work around fat that was going on in the early '80s, around the time of Shadow on a Tightrope, for example, and what is happening now? The web makes a big difference in breaking isolation for fat women – while Shadow on a Tightrope is still extremely relevant, research is much easier to come by, as well as community. Bloggers like yourself create new energy and possibilities. The NoLose conferences also have created a group of fat queer activists who engage in all kinds of tactics. Marilyn Wann stands out to me as someone who creatively engages people in many venues – from passers-by on the lake walk to doctors in training – around the assumptions, misinformation and truth about fatness. Esther Rothblum and Sondra Solovay have done a tremendous job of coordinating fat activists in academia (and its fringes) – their book, The Fat Studies Reader, has been getting mainstream attention – something unthinkable even ten years ago. 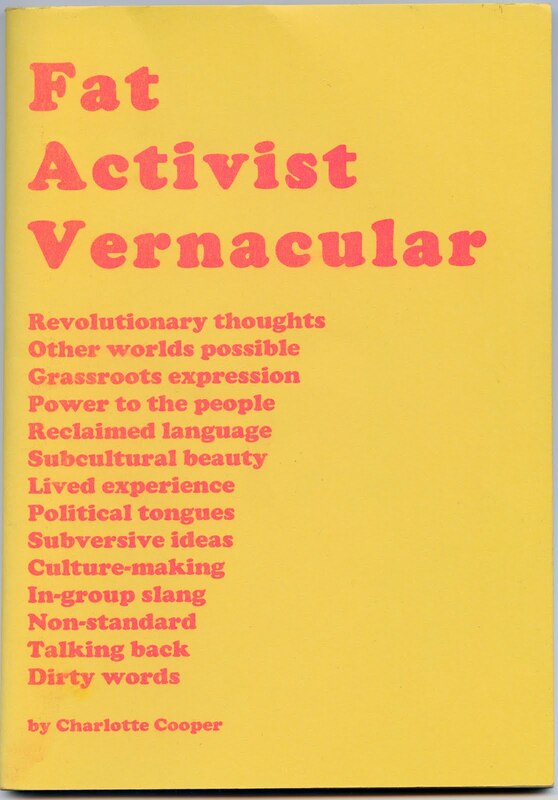 I'm interested in the way you describe yourself as a cultural worker*, I think of this as an aspiration that is politically valuable, a kind of activism in itself. Yet I also see that 'stars' are important touchstones for people, especially fat people. I'm thinking about Gabourey Sidibe, Beth Ditto, and activists like Nomy Lamm, how people find their charisma and star power exciting and inspiring. Got any comments? Wasn't that my comment? But: Virginia Woolf wrote that we cannot become whole until we have accurate mirrors that reflect us. Many kinds of mirrors need to exist. Putting our talents forward is important – I see Nomy Lamm, for instance, as a cultural worker (though I'm not sure what she would say about herself in this context). Sidibe and Ditto will never be stars like Halle Berry and Patti Smith (well, maybe Ditto will, who knows?) – and 'stardom' is worthy of a complete essay in this context. Of course we need all the encouraging images we can get. It's important to keep stars in perspective, though – the few 'exceptional' fat women (dykes, disabled women, women of colour) who 'make' it can be used negatively to keep 'the rest of us' in our places, as well as positively to inform our self-images and activism. What is a radical activist? What advice do you have for people who are new to fat politics? Read: the brand new Fat Studies Reader, the old Shadow on a Tightrope, old copies of FaT GiRL magazine, anything else you can find. Remember consciousness raising groups from the 70s? These might be particularly good to revisit for budding fat activists – gather a group of fat folks together and explore issues. 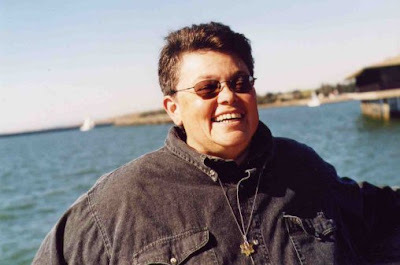 (Old Lesbians Organizing for Change – OLOC – has been doing this around age-related issues for years now.) While the web is a great place to start, nothing beats face-to-face open-hearted discussion. What else would you like to say here? As I wrote at the end of the real fat womon poems, it's crucial "not to let our enemies win inside us." The older I get, the more I realize how sneaky our enemies are, how hard to root out. Centring, settling into our bodies, loving ourselves into our own power is a daily undertaking. Begin here. Burgard, D., Dykewomon, E., Rothblum, E. & Thomas, P. (2009) 'Are We Ready to Throw Our Weight Around? Fat Studies and Political Activism', in: Rothblum, E. & Solovay, S. (eds.) The Fat Studies Reader. New York: New York University Press, 334-340. Dykewomon, E. (2009) Risk. Ann Arbor, MI: Bywater Books. Dykewomon, E. (1997) Beyond the Pale. Current editions available from: London: Onlywomen, and Vancouver: Raincoast. Dykewomon, E. (1993) 'Introduction', in: Stinson, S., Belly Songs: In Celebration of Fat Women. Northampton, MA: Susan Stinson. Dykewomon, E. (1983) 'Travelling Fat', in: Schoenfielder, L. & Wieser, B. (eds.) Shadow on a Tightrope: Writings by Women on Fat Oppression. Iowa City: Aunt Lute, 144-154.